Notwithstanding my previous comments on the talent and work ethic of the current crop of twenty-somethings, I do have to admit that there are few things in life as amusing as a snarky youngster live-blogging the current C-SPAN broadcast of Congressional hearings on credit ratings agencies, chaired by Rep. Henry Waxman. Congressman: What do you think this means, Mr. Raiter? Raiter: Um...I don't know...I guess a casual acceptance of these things. 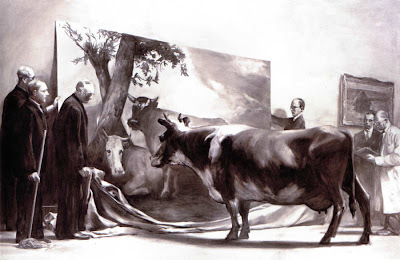 Sean Egan (of Egan-Jones) chimes in: Perhaps that cow was particularly talented? The Innocent Eye Test, indeed.